Rob studied at Bangor University where in December 2015 he was awarded a Ph.D. in chemistry. 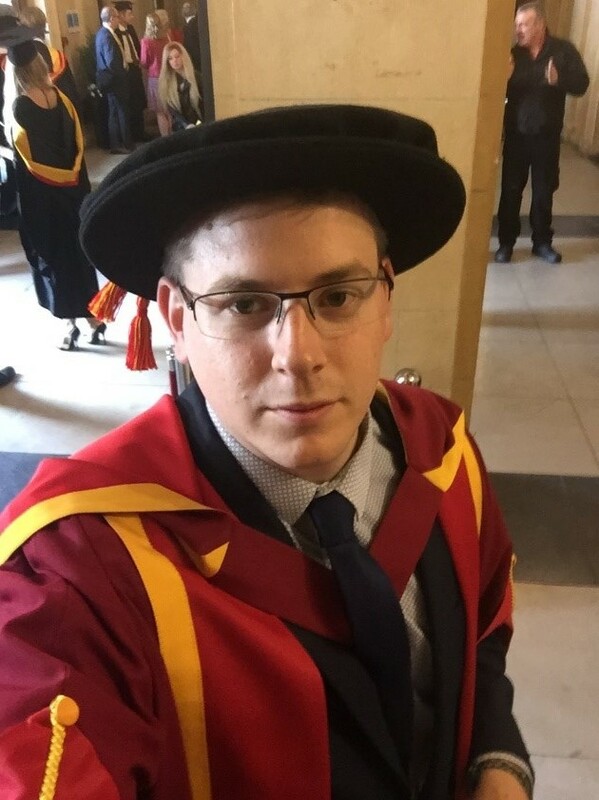 The thesis was titled ‘A universal magnetic carrier for use in cancer prodrug therapy’ and the viva voce was examined by Dr. Peter Searle (Birmingham University). After a brief period of postdoctoral research with the Gwenin group studying a novel drug delivery system, Rob began postdoctoral research for Dr. Peter Holliman. The focus of this work was on emerging photovoltaic materials and energy-related devices. Now Rob has re-joined the group as a research officer to work on the toxicological NRN life science funded project. The main focus of the work is to study the nanoparticle toxicity of the novel drug delivery system. Rob has a wide range of skills in the life sciences research area, but also in electrochemistry and PV research. Contact: r.j.hobbs@bangor.ac.uk Education: 2015 – Ph.D. Chemistry, Bangor University, UK2011 – M.Sc. (Merit): Analytical Chemistry, Bangor University, UK 2010 – B.Sc. (Hons): Chemistry, Bangor University, UK Papers: Connell, P.J.Holliman, E.W.Jones, M.L.Davies, R.J.Hobbs, L.W.Furnell and S. Ghosh, Surface engineering in dye sensitized solar cells, Materials Research Innovations, 2015, 19, 7, 494-496. J.Holliman, A.Connell, E.W.Jones, R.J.Hobbs, L.W.Furnell and S. Ghosh, Solvent issues during processing and device lifetime for perovskite solar cells, Materials Research Innovations, 2015, 19, 7, 508-511. W. Jones, P.J. Holliman, A. Connell, M.L. Davies, J. Baker, R.J. Hobbs, S. Ghosh, L.W. Furnell, R. Anthony, A novel dimethylformamide (DMF) free bar-cast method to deposit organolead perovskite thin films with improved stability, Chem. Commun., 2016, 52, 4301-4304.